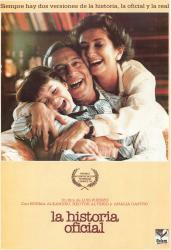 Drama/History, Argentina, 1985, 112 min. Synopsis Alicia Marnet de Ibáńez is a high school history professor and a well-to-do housewife in Buenos Aires, circa 1983, after the fall of the "junta militar" that had taken over the government since 1976. She has a husband, Roberto, who is a succesful lawyer and a five-year-old adopted daughter.